Actor Bryan Batt, who's openly gay, plays a closeted man in TV series "Mad Men"
Editor's note: Bryan Batt, who plays the closeted art director Salvatore Romano in the Emmy award-winning cable TV series "Mad Men," has acted in nine Broadway and nine Off-Broadway productions, such as "Sunset Boulevard," "Beauty and the Beast," "Jeffrey" and "Starlight Express." Batt, who is 45, has been acting for 23 years. He spoke to CNN.com about being an openly gay actor. "We have to work toward acceptance on all levels," says actor Bryan Batt, who is openly gay. (CNN) -- There was once a time when the revelation of one's homosexuality in Hollywood was thought to be a career-killer. Now, out gays and lesbians such as TV host Ellen DeGeneres and pop singer Clay Aiken are featured on the cover of People magazine. There are also more gay characters on prime-time television shows than ever before. But even with greater acceptance by the mainstream public, is coming out still a big deal? 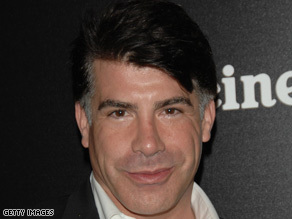 To shed light on the issue, CNN recently spoke to Bryan Batt, 45, about his experience as an openly gay actor in Hollywood. CNN: Has being openly gay affected your career? Batt: I came from the stage; much of my experience has been on the Broadway and Off-Broadway stage. Being gay never really posed a problem. In the Broadway community, it's always been a little more accepted. There's something different with film acting and TV acting. You're in someone's home -- it's more intimate. CNN: When did you come out? Batt: My real Broadway break was in "Starlight Express." At that time, I was toying with [coming out]. It's harder to live a lie than to try to hide your natural instincts and your natural longings just to conform to what other people think you should be. I've heard of people doing it in Hollywood. It's a very sad and difficult choice. I think it's a personal journey, and I think people on their own time will figure it out. Clay Aiken is still really very, very young; he has to deal with his own issues. Thank God, when it was my time, no one was pushing me; no one was trying to force me. It was on my own terms intimately with my mother and brother. It went wonderfully. My mother said, "No matter what, you're my son. I'm going to love you." Not one of my family or friends turned their back on me. I was fortunate, but it was still a very difficult thing to do, and I was fearful. Afterwards, it was like the heaviest weight was taken off my back; all those years worrying for nothing. But not everyone is as lucky; some people are shunned and kicked out of their homes and families, which is criminal. Just this year, I was asked to host a fundraiser for The Point Foundation, a wonderful group that provides full college scholarships to gay and lesbian students of merit who have suffered such treatment by their families and cannot afford tuition and the necessary funds for higher education -- an inspiring organization. I only told my mother and my brother after I was cast in "Jeffrey," a play by Paul Rudnick that was the first AIDS comedy. I said to myself, if I get this, I've just got to sit down and talk with my family. My partner and I have been together 19 years, and that was the same time he told his parents. A good parent knows; they love and accept. What most good parents want for their children is for their child to be happy and healthy and be good contributing members of society. CNN: Are there barriers to what openly gay actors can do today? Batt: It's just like any prejudice, once you let go of any prejudice they all have to go. They're not based on facts, just on stereotypes. I really think yes, there might be some homophobia in Hollywood, but it's based on what will sell. Hollywood is a huge industry, a multibillion-dollar business. If actors who are gay will get ratings and will sell, they will get cast. There are always going to be people who look at people who are different and who disapprove [of them] either through fear or through ignorance. We have to work toward acceptance on all levels. How long ago were the civil rights movement and the women's movement? And, still today, women don't make the same amount of money as men do for doing the same job. CNN: What's your view of the character you play, Salvatore Romano, in "Mad Men"? Batt: The character basically is clearly gay to a 2007 audience, but no one in the world of 1960 is suspicious whatsoever. What a great role to play. This season, I'm married. I get stopped all the time on the street, and I get asked, "When is your character coming out?" What is he coming out to in 1962? I asked to get married this season. I thanked [series creator] Matthew Weiner, and he said, "You asked." It provides another wonderful level to the character. That is what happened then and unfortunately still happens today. CNN: What would you like to see Hollywood do? Batt: Continue to reward good work and put positive role models out there. The one thing about "Brokeback Mountain" -- it was a beautifully filmed and acted film depicting a tortured relationship. The reason I thought the movie was so great is people walked away thinking, "Why couldn't they just be together?" The more positive or interesting the portrayal of gay and lesbian characters, the better. They should show people who are living their good, healthy, responsible, productive lives as role models who just happen to be gay. The opinions expressed in this commentary are solely those of the subject.